Often referred to as ‘the Las Vegas of the North’, Blackpool has for decades earned the title of the entertainment capital of the North of England. High roller Peter Bentham makes another winning bet. With its scintillating illuminations, abundance of theatres that have hosted leading entertainers of their day, a plethora of bars and night clubs and the glitz of the Golden Mile Blackpool has attracted fun seekers from all over Britain. The excitement and glamour of Las Vegas was brought alive at the town’s Masonic Hall when the Blackpool Masonic Club staged a Las Vegas style casino night, complete with show girls, roulette wheel, blackjack, poker and wheel of fortune. In addition, there was the exhilaration and thrills of snail racing – not an event for the faint hearted. Punters lost and won £100’s of £1,000’s while trying to beat the ‘house’. Amongst the ‘high rollers’ were past group chairman Peter Bentham, club president Colin Goodwin and club treasurer John Morris. 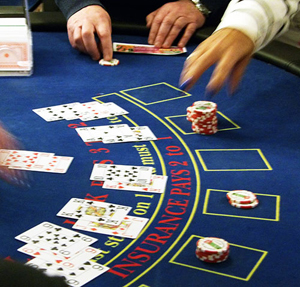 Betting was particularly lively on the roulette table and the blackjack croupier was kept on his toes with skilful play by some of the revellers. The night was full of fun from the moment that the clients were greeted by Las Vegas show girls serving complimentary flutes of champagne. A generous and extensive buffet ensured that the gaming could continue uninterrupted and entertainment from a traditional ‘swing’ crooner kept the masses in high spirits. Some good hands at the blackjack table. Fortunes were won and lost but, as one would expect of a Masonic hall, there were no tears if the cards and wheels did not favour the gamesters – the money was not, of course, real. But the excitement was still genuine, even if it was only ‘funny money’ that was being stacked on the tables. The revellers arrived in style, sporting dashing evening wear, and immediately got into the spirit of the night. 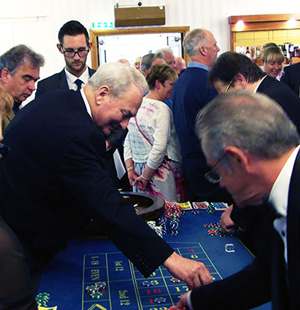 Organiser Eric Young was on hand as the casino commissionaire to welcome each guest and usher them to the gaming tables, offering valuable advice to the novice gambler. “It was a fabulous night”, was the general consensus of the carousers and all look forward to another occasion at which to try their luck at being ‘high rollers’. They are already saving up for the next spin. Viva Las Vegas! The tables were kept busy all evening.